Sarna lotion was created for people with dry, itchy skin. The Sarna line includes anti-itch creams and lotions made for people with regular to sensitive skin types. Sarna products do contain an active ingredient that may cause skin allergies in some people. Sarna has several lotions and creams geared towards helping people with dry, itchy, or sensitive skin. The lotions are available over the counter and contain the active ingredient pramoxine. Pramoxine is used to treat burning sensations, itching, pain, and general skin discomfort. Sarna lotions are tailored to treat general itchy skin, eczema, sunburns, bug bites, and poison ivy. The lotions also work as a general daily body lotion. The Sensitive Anti-Itch lotion is intended for daily use by people with sensitive skin. It does not contain fragrances or dyes, which are known to irritate the skin. The Sensitive Anti-Itch lotion relieves minor itching and discomfort due to skin conditions such as eczema. The Sensitive Anti-Itch lotion is sold in a 7.5 ounce pump bottle. The Original Anti-Itch lotion is formulated to soothe skin with sunburns. The lotion also works to relieve itching caused by poison ivy and bug bites. The Original Anti-Itch lotion contains dyes and fragrances and is not recommended for people with sensitive skin. The Original Anti-Itch lotion is sold in a 7.5 ounce pump bottle. The Ultra Cream is a thick cream specially formulated for dry skin on the arms and legs. The Ultra Cream is also a skin protectant that lasts up to 24 hours. The cream does not contain steroids, but does contain dyes and fragrances and is not recommended for people with sensitive skin. Sarna Ultra Cream is sold in a two ounce squeeze tube. Sarna lotion should be applied at least once a day, and no more then four times a day. The lotion should only be applied to small areas of the body that are affected by itching, pain, or discomfort, such as a bug bite. Before using the lotion, shake the container well. Apply a small amount of the lotion to clean, dry skin and rub it in with your fingers until the lotion has dissolved. Immediately wash your hands after you have applied the lotion so you do not get it in your eyes or mouth. If you do get the product in your eyes or mouth, it may cause swelling and other irritations. Immediately flush the area with water until you are sure the product has been rinsed out. Very few people will have side effects while using Sarna lotion. The most common side effects include itching or burning. This can occur on the area of skin were the lotion was applied or in your mouth or eyes if they accidentally come in to contact with the product. Some people may experience a serious allergic reaction to the lotion. If you notice your skin developing a rash around where the lotion was applied, or you are dizzy or lightheaded, you may have developed an allergic reaction to the lotion. You should wash the area immediately with soap and water. If the reaction does not subside after washing, contact your doctor. An allergic reaction could develop into a potentially threatening problem if left untreated. 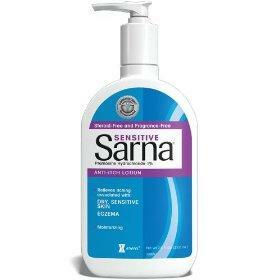 Sarna lotion can be found in the skincare products aisle of most drugstores. You may also find it in grocery stores and mass retailers like Target or Walmart. You can also purchase Sarna products online through several websites. The major websites, like Amazon and Drugstore.com, sell Sarna products. You can also buy the products from several other websites. However, before purchasing through a website, verify that the company does offer product returns. This way you can return the product for a refund if you are not satisfied with your purchase.